Description: Mastersmith Bill Burke created this exceptional utility knife with the idea of creating a perfect every day carry knife. The satin finished 52100 carbon steel blade was triple quenched and triple tempered for grain refinement and optimal edge holding. 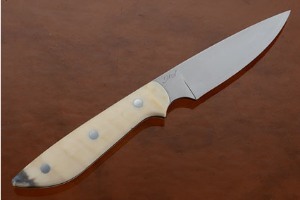 Many makers and collectors feel that 52100 is among the best steels available for knifemaking. A differential heat treatment ensures strength and durability. 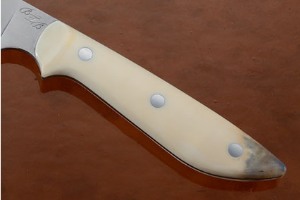 The walrus ivory handle is nicely rounded for a sure, comfortable grip. The ivory scales are cream toned with hints of rare blue tones. 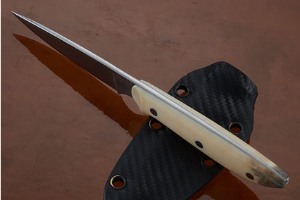 Both the blade and tang are distal tapered for perfect balance. The knife is accompanied by a sturdy Kydex belt sheath that is sure to keep this knife at the ready when not on display. Adding a Tek-Lok allows for easy belt carry. Adding paracord would allow it to be used as a neck knife. 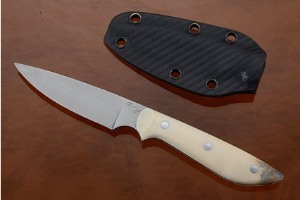 An excellent knife from Mastersmith Bill Burke that is a unique digression from his norm, and truly a hard to find, superior little performer!